Lisle is a village in DuPage County, with an estimated population in 2008 or 23,135. It is part of the Chicago metropolitan area and the Illinois Technology and Research Corridor. 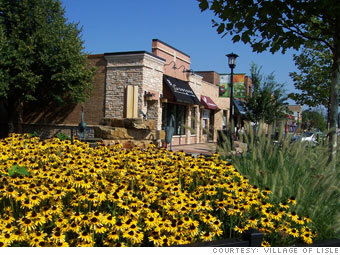 In July 2007, Lisle was ranked #20 in Money magazine’s list of “100 Best Places to Live” and #17 on their 2009 list of the “Best Places for the Rich and Single”. Downtown Lisle has recently completed an award-winning renovation and has been transformed into a beautiful, pedestrian-friendly retail and restaurant district that is truly the heart of the community. The new downtown features a beautiful prairie style streetscape which entices people to stroll past extensive planting beds filled with flowers and grasses. Fifty six trees provide welcome shade while sitting areas create a relaxing garden-like setting for visitors. Prairie style lanterns light up Downtown Lisle at night. CA Technologies and Molex are among the largest companies based in Lisle. Navistar recently relocated its headquarters to Lisle, occupying the large corporate buildings previously owned by Lucent Technologies. The corporate footprint of Lisle continues to expand as large companies seek an easily accessible, highly visible alternative to Chicago. The North American corporate headquarters of the market research firm Millward Brown, also located in Lisle. Lisle is home to the stunning Morton Arboretum. It covers 1,700 acres and is made up of gardens of various plant types and collections of trees from specific geographical areas. It includes native woodlands and a restored Illinois prairie. The Arboretum has over 4,100 different species of trees, shrubs and other woody plants from around the globe. In all, there are over 186,000 catalogued plants. The Arboretum has 16 miles of hiking trails and nine miles of roadways for driving/bicycling. The Arboretum features a four interactive “Children’s Garden” and a 1-acre “Maze Garden.” Other special landscaped areas include the Fragrance Garden, Ground Cover Garden and Hedge Garden. The Schulenberg Prairie is one of the largest restored prairies in the Chicago suburban area.